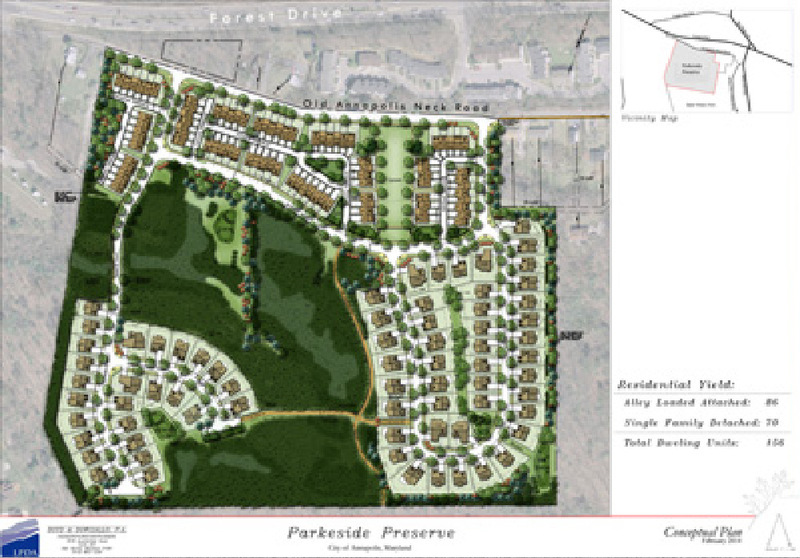 Parkeside Preserve in Annapolis will be developed for 70 single-family homesites and 86 townhome lots. It comprises 39 acres. The site was assembled from 21 separate parcels in 2006. Toll Brothers terminated a contract to acquire the site in 2008. The owner sought out CRP to be its development partner. Area single-family homes sell for $500,000-600,000. Townhomes sell for approximately $290,000. Parkeside Preserve in Annapolis is well-located on busy Forest Drive, within 2 miles southwest of Annapolis City. Population within a 10-mile radius is approximately 180,000. Average household income in the area exceeds $120,500. Shopping is abundant, including Annapolis Town Centre, a 2 million square foot mixed-use development anchored by Target, Whole Foods, Bed Bath & Beyond, Anthropologie, Brooks Brothers, Arhaus Furniture and many other luxury retailers. Parkeside Preserve in Annapolis directly adjoins Quiet Waters Park. The 340-acres park offers access to the South River and features a concert pavilion, ice skating rink, 6 miles of paved trails, children playgrounds, the Blue Heron for indoor functions of 175-225 people and more.